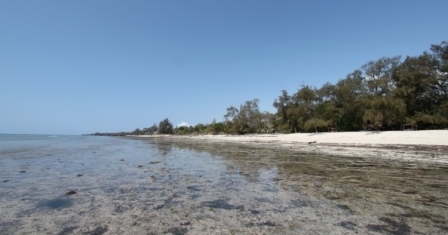 How to describe Paradise; how to describe Kinondo Kwetu? You might be looking for something special, something that you will remember forever...perhaps you're getting married and making plans for your honeymoon, maybe thinking of finishing your safari 'in style, or simply a memorable stay by the beach?! Here is where the 'Paradise' part comes in! Nothing less – nothing more! 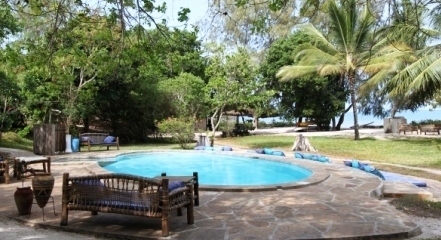 Kinondo Kwetu, located on the south coast of Kenya, right by the warm, blue, clear Indian Ocean, fits the bill!! At least, it comes very close...but you decide! Let me tell & show you a little bit about my short, but unforgettable stay there. It really is like the brochure says; you might miss the entrance at first glance, and we (taxi driver & I) surely did. We found it when we looped around, and once these doors open, you’ll find yourself transported into another world. 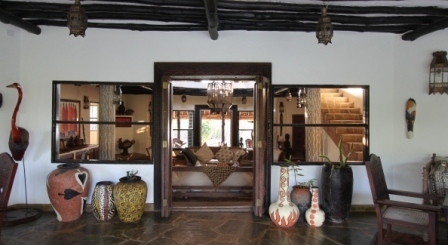 I had the great pleasure of meeting Ida Trygg Andersson, Managing Director/Owner who showed me around and told me all about Kinondo Kwetu and how it came to be from a cherished private home and a decision to open it up, to people coming in and experiencing this little piece of paradise. 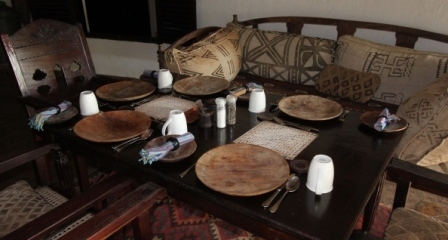 There is the main house, where breakfast is served in the morning, as well as lunch and dinner. 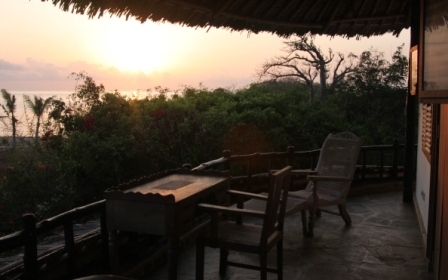 It houses a wonderful, abounding library and a beautiful sitting area, overlooking the property out onto the ocean. Two smaller, separate houses/villas can accommodate families, and a handful of beautiful cottages (doubles) are situated around the smaller of the two beautiful, inviting pools. 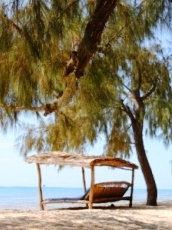 On the other side of the property, along the ocean, is the Mama Taa Villa. It has another exquisite sitting/lounge area, a few luxurious double rooms and the most amazing 'honeymoon' suite, and yes, I got to stay right there! Ida suggested a massage, which is being given at the most amazing area, overlooking the ocean, hidden behind trees and a 'secret' serene spot on a cliff, where you can also meditate and do your yoga. It sounded heavenly, especially after a long, hot drive and it didn’t take much to convince me. Before I tell you more about Kinondo Kwetu, let me first report about this incredible suite I was to call home for the next few hours and night. I really don’t know where to begin, as it took my breath away. Being a photographer, first things first, I had to take some picture and that’s one way for me to take it all in. 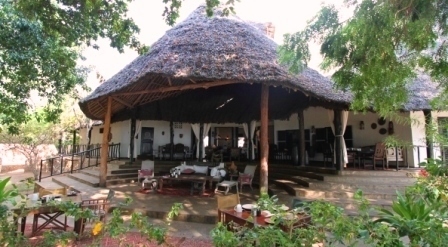 The suite is located at the top corner of the Mama Taa Villa and opens out to three directions; balcony going all around. 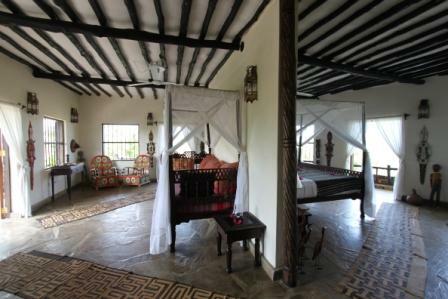 It is split in half, although still being open, but it divides the room into the sleeping area with the bed facing the ocean, and the other having a lounge area overlooking the property garden. 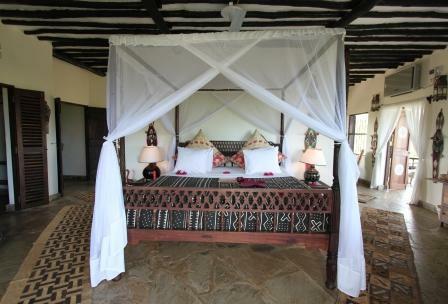 Everything is decorated to perfection at Kinondo Kwetu, with a spacious bathroom, and walk-in closet. You can leave the double doors and windows open and let the breeze go through the suite, or/and close at night and opt for the air-condition. Everything is prepared and set up by the wonderful staff and you will have it all the way you’d like it, when you return back from your dinner. But I’m jumping ahead; back to my massage. I showered, changed and was on my way. I can truly say that this was THE best massage I have ever received and I felt like a new person and completely relaxed. The pool was calling my name and in I went. There is something about these pools that radiate such tranquility and peacefulness; but that might also have something to do with the complete harmony in the surroundings. After a short walk on the beach I headed back to my suite, lounged for a bit, testing every chair on the balcony and different views, before getting ready for dinner. The food was out of this world and I ate way too much. From a delicious soup, main course, wine, to dessert with tea; I couldn’t have been any happier. The waiter was absolutely charming and we had a nice conversation throughout the whole dinner, while he came & went to bring me more and more food. A little later I fell into this incredible comfortable huge bed and was out like a light and only woke up in the morning to the first rays of the sun coming up over the ocean. Simply didn’t want to leave! Breakfast called and after wandering around the property and a dip in the pool, I found my way back to the main house and the most delicious brunch you can imagine. From fruit juices, cereals, fresh baked goodies, pancakes/chapati’s, eggs, whichever way you like them, pastries, fresh fruit, coffee, tea...you name it! Again, I ate way too much; what can I say?! It was approaching time for me to head back to the city, so, I packed my few things, but not before another quick dip in the pool. While I sat and waited for my taxi, just thinking to myself how nice it would be to have something cold to drink, this lovely waiter came out of nowhere and delivered just that. It was like magic! My stay felt so much longer than it actually was and I enjoyed myself immensely, but have to admit, besides the pure pleasure of sharing an experience like this with somebody, it would have been even more enjoyable with 'a special someone'. Nevertheless, it will stay with me forever and I’m having plans of going back and sharing it next time!! 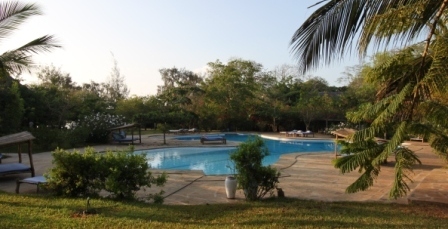 Are you interested in booking at the Kinondo Kwetu? Click here for the best rates & deals!